When the menu plan showed the simple word “Pasta”, I froze. Why wasn’t I more specific when inputting everything into my calender?! Did I have enough in our pantry to make something filling, healthy, AND delicious? Honestly, what can go wrong when you know there’s going to be fresh basil and fresh mozzarella all up in your mouth? Absolutely nothing! Since the basil came from my own teeny garden, even better (and rain soaked)! 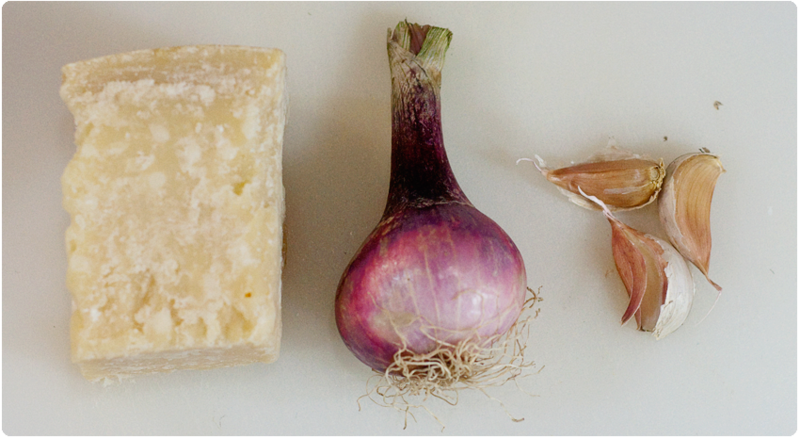 I called my husband to see what he thought of a basic pasta dish and he said he wanted something a bit creamy and cheesy… so I thought what better to add to the mix than some for real (stamped rind and all) Parmigiano-Reggiano, a large shallot hacked to bits, and garlic minced up! I also decided to use some heavy cream to make it super rich and awesome. 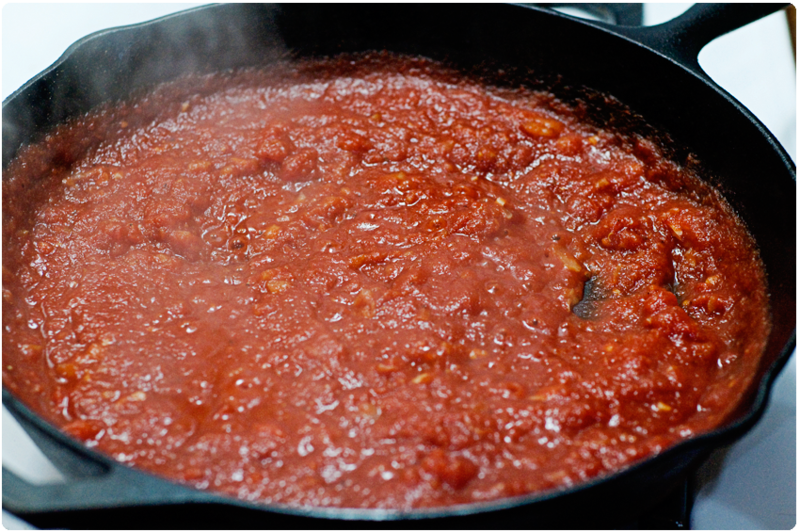 First thing is to get a LARGE pot of water on the stove to get boiling so by the time the pasta is cooked, the sauce is ready at the same time. Once your water is boiling, toss a handful of kosher salt into the water. You might be saying WHAT? A HANDFUL OF SALT?! Yes. People under-season their water when cooking pasta (or even worse, add oil) and that’s why you end up with a bland dish or over-seasoned sauce. Get the pasta into the boiling water, give it a good stir, and set your timer for ten minutes. While that’s going, get a large skillet out, coat it with cooking spray or just a touch of olive oil and toss in your minced shallot and garlic. Cook for about two minutes on medium-high heat. 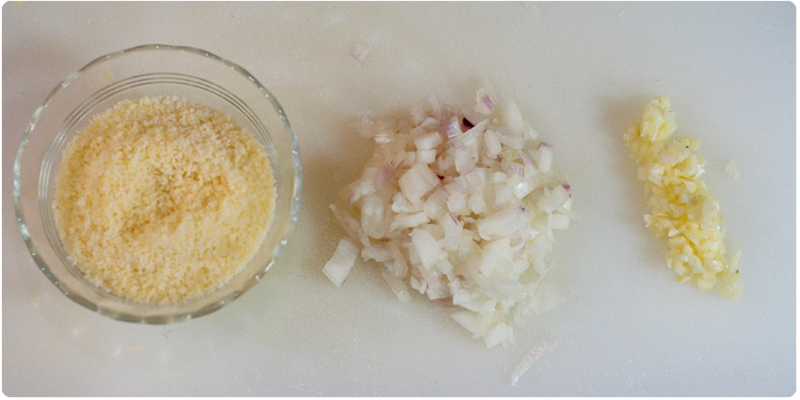 Add your crushed tomatoes and season with salt and pepper. Let simmer on low-medium heat while the pasta cooks. When the timer on the pasta has two minutes left, add your basil, heavy cream, Parmigiano-Reggiano, and fresh mozzarella to the sauce. Turn off the heat. Drain your pasta and add to the sauce, tossing gently until everything is combined. This makes five 1C servings at 315 calories per serving. 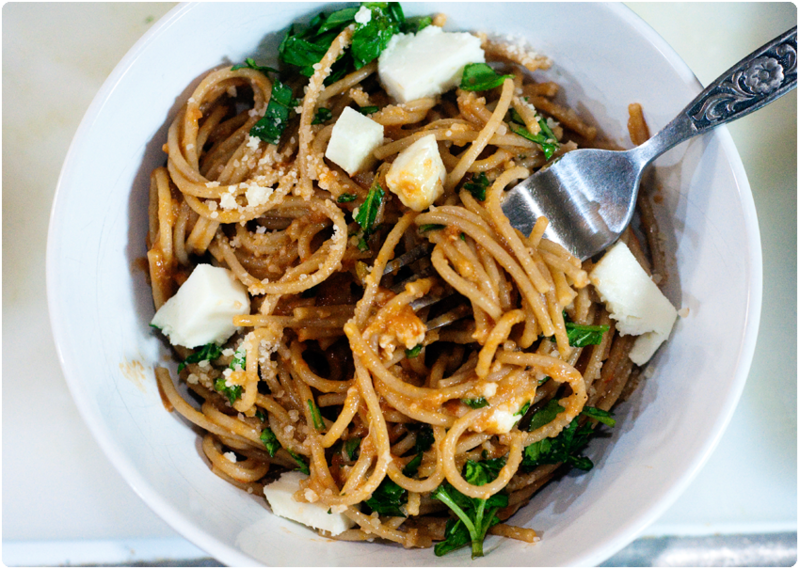 You can garnish with extra basil and grated Parmigiano-Reggiano if you want! Also you could add some grilled chicken or shrimp with this dish OR on the side a nice salad and some dinner rolls would work wonderfully too. Oh Sarah- those are such beautiful food photos. You are so talented!!! Aww thank you! I wasn’t happy with them because the light was so poor due to the storms last night lol. Some sauces, especially a basic marinara really should cook like all day but this was a great sauce for a quick dinner that kept the brighter tomato flavor! I rarely use heavy cream but for 5 servings, the extra 150 calories that was the heavy cream in this recipe wasn’t too bad! DH and I love spicy and the kids handle it pretty well, I was thinking of adding red pepper flakes next time around lol. OHHH would LOVE it if you shared (even guest posted here!) your puttanesca recipe! This looks/sounds so yum. We eat a ton of pasta, so I’m definitely going to have to try this. It’s super tasty, we didn’t have ANY leftovers lol. That does look awesome! And so easily veganized! I don’t eat a lot of pasta, but I might have to give this a try on one of my ‘lazy days’ since it looks quick and easy. This heat wave has seriously been wiping me out. I just can’t stand over the stove all day/night. :( I seriously can’t wait for Autumn! And all of the glorious baking! Ok I’m running off topic lol. That’s one nice looking shallot though! We finally FINALLY got our central air fixed, it’s amazing to me to even be IN the kitchen much less comfortably COOKING lol! The shallot I got from the farmer’s market, they were huge!! I hate regular cream sauces, but this one looks like it would taste AMAZING! I am going to have to try this one out :) TY for sharing.